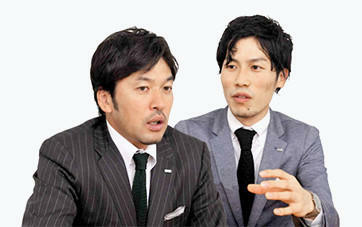 resonates with everyone in the Tenjin district, and will in future develop hand-in-hand with the local area. Taking advantage of proximity to East Asia, since days gone by Fukuoka has been a cosmopolitan city and a hub for people, goods, and exchanging information. 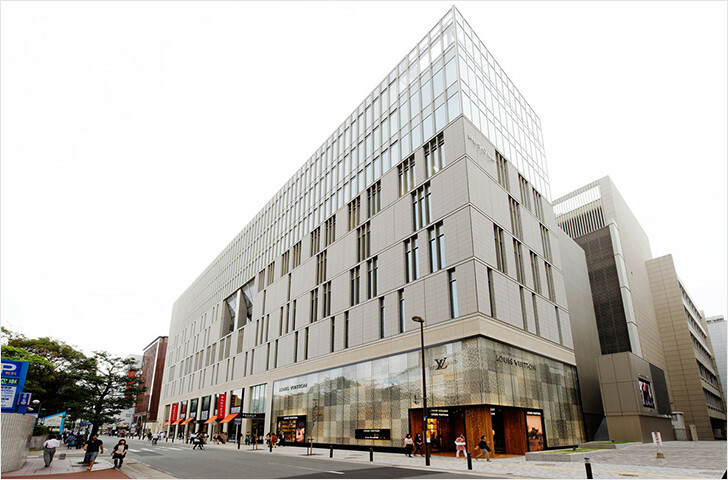 The Tenjin area is seen as a `pivot` being host to Kyushu`s pre-eminent entertainment & office precinct. The "Urbannet Tenjin Building (Resola Tenjin)" Fukuoka Tenjin Project was launched with the aim of giving the area a further boost. 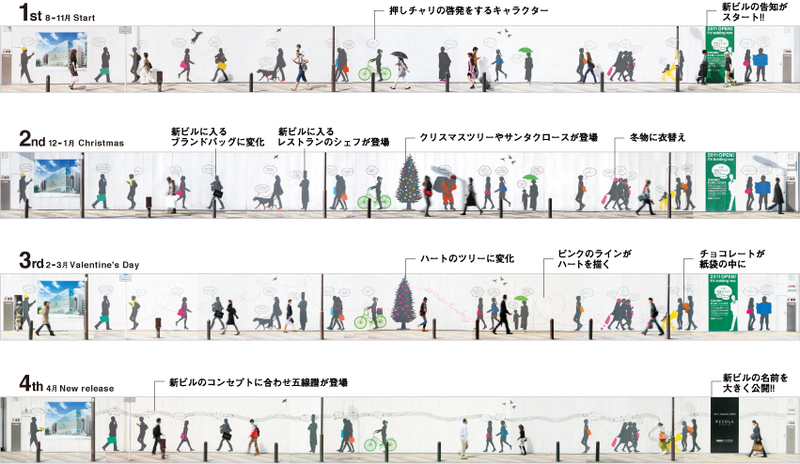 The "town" that the Urbannet Tenjin Building (Resola Tenjin) aims to achieve. 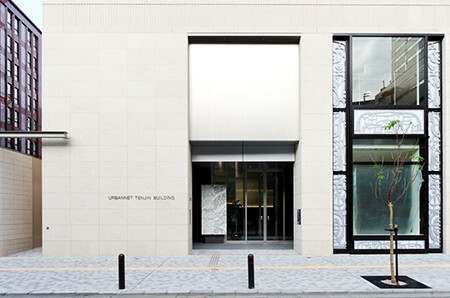 Urbannet Tenjin Building, completed in 2011, is a multipurpose integrated complex that offers vibrant commercial space and advanced office facilities. As a new landmark in Tenjin, the facility aims to lead the district as a constant source of stimulation and new topics of interest. The commercial facilities consist of 5 floors above ground and a basement. With the keyword imagery of "Clear Skies ("Haresora" in Japanese) in mind, derived from the Japanese kanji characters for Tenjin (天神),　a high quality of style worthy of Tenjin is offered: a pleasant shopping zone and, sophisticated fashion/food/spaces. Offices on the upper floors have an exclusive entrance, and are bright and comfortable workspaces surrounded by glass curtain-walls. Endowed with outstanding views, these quality offices spaces also offer a high degree of flexibility. Be it business or shopping, access to Resola is very convenient.Kego Park adds to the lush & serene townscape. The site is totally in harmony, yet full of energy and contributes to building a town that will be loved by all. In the pursuit of tasteful design the greenery of adjacent Kego Park is utilized along with an awareness of affinity with surrounding commercial establishments. The property is a 3 level structure: the lower level appeals to commercial businesses whereas, mid-level activity can be viewed from slit windows, and the upper floor is wrapped in a glass curtain. Also, while emphasis is placed on the beauty of the property itself, the buildings are attractively aligned: "NTT-T Building" (Iwataya Honkan) to the north and, "NTT-KF Building" to the south. A 252 seat/400 person capacity hall with annexed multipurpose spaces consisting of foyer and pantry facilities that can accommodate various exhibitions, lecture presentations, recitals, etc. The combination of hall and foyer enables highly unique event arrangements. CFT columns with steel tubes filled with concrete are adopted.Placement of special energy-absorbing braces gives the structure outstanding earthquake resistance capability. 4. Equipped with Non-Contact IC Card Key and Multi-Card Readers. High performance multi-card readers are installed at all entrances to private areas adjoining shared corridors.Clients can select from 3 types of highly secure IC cards that meet FeliCa standards. Security cameras and motion sensors are installed in shared areas such as dedicated office entrances and corridors.Security is ensured. Electric capacity is secured at an generous 70VA/m2 to ensure stable use of office equipment.Each distribution fuse box has its own dedicated cabling to improve reliability of electric main lines. Conduits in place for pulling in optical fiber cables & various requirements can be catered for.Communication conduit has been installed in each floor so in-house LANs can be set up between different floors. The revised Energy Saving Act enacted in April 2010 requires each individual business operator (company) to submit energy management reports.Detailed management of power usage becomes possible by implementing the BEMS system: use of lighting, outlets, and air conditioning etc. Settings make it possible to fine-tune air conditioning control possible to improve comfort and energy saving efficiency. We asked the person in charge of development about the intent of the development and any episodes that occurred from the planning stage right through to completion. 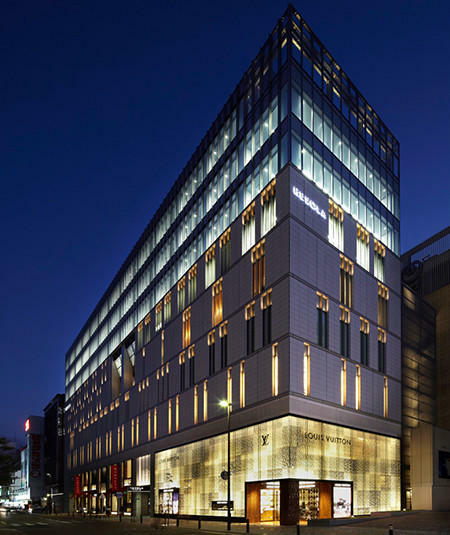 What factors were considered in building this property in Fukuoka`s Tenjin district, the heart of Kyushu`s economy? Tenjin is a compact, integrated town consisting of many commercial establishments such as department stores, shopping malls, underground malls, and arcades. People can go to where they want to go and enjoy their own lifestyle: there is a lot of movement in and around town.People who are fashion conscious and have refined tastes gather here from within and outside Kyushu. Everyone who comes here has an affection for the place.When we were considering constructing a building here in the "heart" of Tenjin, we thought the property would generate new appeal for the area.Well established department stores have been gathered in this area for many years. This zone also links-up with an area lined with designer boutiques popular among young shoppers and near a station which is a location that we wanted to leverage. 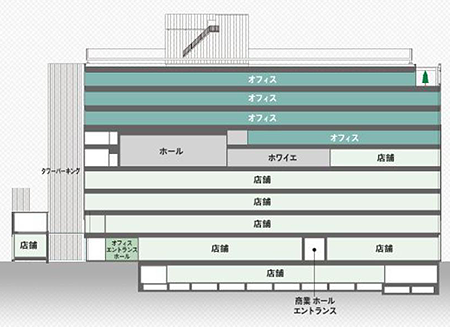 We thought the building would act as a gateway that would bring about a new flow of people to Tenjin. Contribution to the streetscape is also an important concept you say. From design perspective, because this building is located between NTT-TK Building and NTT-KF Building, we aimed to create a beautiful streetscape by lining up the three buildings.With the setback and planted trees, a wide and cozy sidewalk is connected, creating more liveliness than ever before.We also asked NTT West for their cooperation to release part of the large screen billboard "vision" wall next to the north side of the building, to effectively show the store exterior.This is what people become aware of as they move down the street or view the property from Kego Park out front.The upper level utilizes a glass curtain to convey a sense of freedom where the background seems to merge into the sky. The mid level use of rhythmical slit windows produces a visually pleasurable feel.10 lighting patterns follow a theme of "Interaction of greenery and people" to create an elegant atmosphere of shops and restaurants. This can be viewed through the slit windows which is an aspect we want people to focus on. 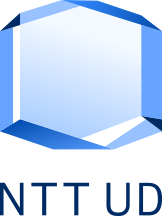 ――Did you encounter any difficulties when completing the building? ――The Great East Japan Earthquake occurred during the development. There were The promotion for the end users prior to the opening was impressive. While the building was under construction we designed a fence around the site to produce a sense of hustle & bustle while at the same time making a provision of space for information about the building.We worked with a local designer to create an illustration of the comings and goings and murmurings of people passing by the site.The murmurings naturally included appealing points about the building of course.We changed the design 4 times to follow the seasons. According to announcements we showed silhouettes of chefs, sometimes shoppers holding store bags appeared. As we moved towards opening the momentum gained pace. We also produced a freesheet called "BOND" with lots of information on Resola Tenjin and the Tenjin area which we distributed on the street 2 weeks prior to the opening.The staff wore raincoat ponchos when distributing "BOND".The naming of Resola Tenjin is derived from the word "Haresora" which expresses a sky becoming clear to convey the concept of the Resola Tenjin launch.Web movies linked with Twitter and Facebook were also prepared for the official website as part of this concept. ――What is the state of the town after completion? ――Could you pass on a message to the people who are going to visit "Urbannet Tenjin Building (Resola Tenjin)"? The commercial zone "Resola Tenjin" has 3 shops and 1 restaurant as tenants.Every shop has takes pride not only in the products and services but also how spaces are decorated.The store staff are wonderful in their attention to the smallest details so I hope that patrons sense that comfort levels have moved up a notch. 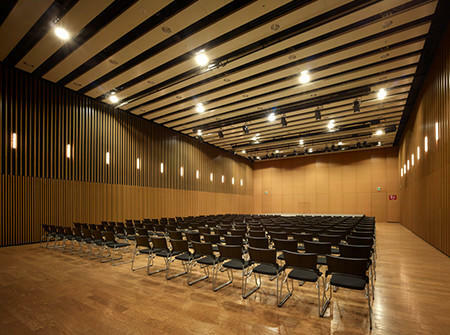 The Resola NTT Yume Tenjin Hall is compact, but also decorated using choice quality wooden textures.A popular performer came along and performed at the opening event so the space had a wonderful feel of everyone coming together as one. Since there are many people in Fukuoka who are eager to transmit information, we hope this hall will be frequently used and a facility that is loved by locals.